That picture comes courtesy of the film's director, Todd Phillips. The caption, "Arthur," seems to be the clown prince of crime's real name, at least if a report from That Hashtag Show is correct. 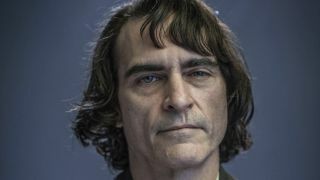 According to THS, Joaquin will begin the film as "Arthur Fleck," a down-on-his-luck man who returns to Gotham to be with his ailing mother. "What made you what you are? Girlfriend killed by the mob, maybe? Brother carved up by some mugger? Something like that, I bet. Something like that... Something like that happened to me, you know. I... I'm not exactly sure what it was. Sometimes I remember it one way, sometimes another... If I'm going to have a past, I prefer it to be multiple choice!" Personally, Warner Bros., Phillips, and Phoenix are going to have to sell me really hard on the idea that this is a movie I need to see. Some things work better without an origin story, and Joker is one such creature, in my opinion. But what about you? Do you think this looks like a man that could go on to become Batman's greatest enemy? Hyped or not, the Joker movie continues to make progress. Which is more than we can say for The Batman, the solo movie starring... well, Batman. That movie is not doing so well.